The hysterically funny, best selling book comes to life in this smash-hit family comedy! Greg Heffley is headed for big things, but first he has to survive the scariest, most humiliating experience of any kid’s life: middle school! That won’t be easy, considering he’s surrounded by hairy-freckled morons, wedgie-loving bullies, and a moldy slice of cheese with nuclear cooties! When a gifted ghostwriter is hired to write the memoirs of former British Prime Minister Adam Lang, he quickly finds himself trapped in a web of political and sexual intrigue. Lang is implicated in a scandal over his administration’s harsh tactics, and as the ghostwriter digs into the politician’s past, he discovers secrets that threaten to jeopardize international relations forever. Gathered together in the Bahamas for their annual one-week reunion, four close couples eagerly reconnect, sharing news about their lives and relationships. But their intimate week in paradise is disrupted by the unexpected arrival of Sheila’s ex-husband, Mike, who hopes to break up her new marriage with Troy and win her back. With their relationships hanging in the balance when they return home, each couple must choose between blame and forgiveness. 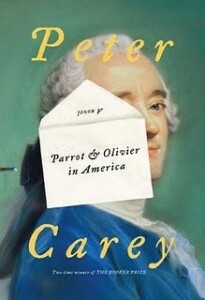 Two-time Booker Prize winner Peter Carey creates a vividly funny work of historical fiction in Parrot and Olivier in America by imagining the real-life experiences of Alexis de Tocqueville, a French aristocrat and author of Democracy in America, a hugely popular work first published in 1835. Carey cleverly uses dual narrators, each with completely different perspectives; Alexis is protrayed as Olivier while his servant companion is John “Parrot” Laritt. Parrot is the orphaned son of an itinerant English printer who is forced to accompany Olivier as he sets sail for the United States. Ostensibly, Olivier is being sent to research the U.S. penal system for a report to the French government. In reality, he’s being sent by his parents (who barely avoided the guillitine during the French Revolution) as a politically-correct way for their son to safely escape the reignited Terror back in France. In alternating chapters, Parrot sets the tone as the more likeable character — though uneducated and long-suffering, he’s obviously talented and intelligent. Olivier initally comes across as a pampered snob (Parrot often refers to him as “Lord Migraine) but he proves remarkably open-minded in observing most Americans (with President Andrew Jackson as a notable exception). As the novel progresses, we see a change in attitude. Indeed, a most unlikely friendship develops, particularly as both title players have varying troubles with their love lives. I think it’s primarily because the characters are so well developed (even the minor ones) that makes this an enjoyable and entertaining read. And then, the little history lesson is just thrown in for free! All of which, it turns out, got seeded ahead of me for the 36th Annual Quad City Times Bix 7. Apparently an answer of “0” on the registration for prior Bix finishes funnels one into the pile with certain species of mold, molasses, and garden slugs. Silly me, I forgot to pack my salt shaker! That being said, I can’t really complain about the finish. It’s a number that reflects an outdated engine being fueled by aggression and liquid-cooled by a torrential downpour. As a reward, it’s time to hang up the $120 shoes that cost 17 cents in foam rubber and Malaysian labor in exchange for a world where one doesn’t walk down steps like Frankenstein. In retrospect, I learned an awful lot about this little subculture those sweltering Thursday nights and that timed monsoon morning. -The finish-line beverages they serve to simultaneously carbo-load and rehydrate you are especially refreshing at 930AM. What better way to celebrate the legacy of young Beiderbecke? -The people that live along the route are a special breed of patient, compassionate, and proud. Your selfless hose work and ice cubes every Thursday night are a testament to the human spirit. -Antagonizing people whose bodies are in oxygen deprivation with a lit cigarette is not funny. Seriously dude, you have a problem. That problem, incidentally, is that you’re plagued by erroneously finding your schtick amusing. Your sidewalk privileges are revoked effective immediately. -Don’t respond with an impudent tone when it’s suggested you double-knot your laces prior to the race. If you’ll excuse me, I have a one-floor elevator ride to catch. 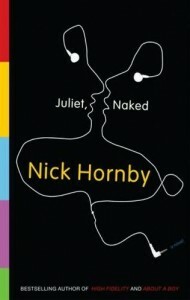 Juliet, Naked by Nick Hornby is the story of three people and their love of music and each other. Duncan and Annie are a couple from England who have been together for 15 years, for reasons neither are really sure of. Duncan is obsessed with musician Tucker Crowe, who abruptly gave up his music career two decades ago following the release of Duncan’s favorite Crowe album, titled Juliet. When the book begins, Duncan and Annie (a much less enthusiastic Crowe fan) are on a trek through America visiting famous spots where Tucker Crowe spent time. After disagreeing about the merits of Crowe’s comeback album (an acoustic work entitled Juliet, Naked), Duncan commits the ultimate betrayal, and he and Annie part ways. But while working to mend her broken heart, Annie is contacted by the person she least expects: the musician himself, Tucker Crowe. The two forge a relationship that is completely unexpected, yet fitting when you finally see it come together. I was drawn to this book for two reasons: I thought the cover was cool (yes, even librarians sometimes judge books by their covers), and the fact that it’s written by Nick Hornby. This is the second book by Nick Hornby that I have read. One of his earlier books, About A Boy, is another enjoyable read if you liked this book. If you like books about musicians and their fans, Hornby’s books are for you; he is clearly very interested in music, with this book being focused on the fictitious Tucker Crowe and About A Boy carrying a large focus on one character’s fascination with Kurt Cobain. It was interesting to see a sort of “behind the scenes” look at the life of the musician (even if he wasn’t real), and because of this, Tucker Crowe himself ended up being my favorite character. The ending, while slightly open-ended, provided enough closure that I had high hopes for Annie and her new life. Overall, I found this to be an interesting and enjoyable read. Looking for a uniquely Iowa activity this summer? The 2010 Hooverball National Championships will be Saturday, August 7th. For the uninitiated, Hooverball is similar to volleyball and played with a four or six pound medicine ball (women’s and men’s versions respectively). “Catching one of these balls is like catching a bag of concrete mix dropped off a freeway overpass,” according to CBS Sunday Morning. The speed and grueling nature of the game made it a fast and efficient way to exercise all one’s muscles, which was the appeal for President Hoover and his doctor. During his presidency, Hoover lost 25 pounds which they attributed to his regular morning Hooverball games. Teams were made up of Cabinet members and Supreme Court justices. Every day but Sunday, they played on the front lawn unless the weather drove them down to the White House basement. West Branch may be the only town in the world with it’s own Hoover-Ball courts on Main Street. Other Hooverfest activities are fireworks at dusk, a band, food tents and a beer tent. Read more about Hoover in the recent biography, Herbert Hoover by William Leuchtenburg. It’s that time again – Davenport puts on it’s party hat (and running shoes) and hosts the annual Bix Beiderbecke Jazz Festival and the world-renowned Bix 7 Road Race. There’s plenty for everyone – music, shopping, running (or walking) so get out there and soak up some of the great atmosphere that helps define the city of Davenport. Because of the crowds and chaos in the downtown, the Main Library will be closed all day on Saturday, July 24. However, both the Fairmount Branch Library and the Eastern Avenue Branch library will be open their regular hours, 9:30am to 5:30pm. Main will reopen on Monday at usual. 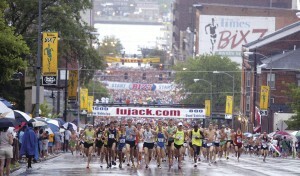 And be sure to check the blog next week and find out how our own Bill did in his first Bix 7 race! Here it is, the hot book of the summer! A sensation in England, the movie adaptation, starring Anne Hathaway and Jim Sturgess, is already in pre-production and is scheduled to hit the local multi-plex in 2011. Just published in the US, One Day by David Nicholls doesn’t disappoint. Emma and Dexter meet on July 15, 1988, the day they’re graduating from university. While there’s an instant connection between them, they go their separate ways the next day. For the next 20 years on the anniversary of their first meeting, we take a look at their lives, how they’ve grown and changed (or not), the mistakes they’ve made and their triumphs. Through it all, they remain best friends, turning to each other in good times and bad, weathering disappointments and a falling-out. Dexter becomes a tv presenter, slips into a black hole of alcohol abuse and drugs and struggles to right himself. Emma endures dead-end jobs and unhealthy relationships until finally realizing her dream of becoming an author. The constant in each of their lives is the other, an extraordinary friendship that transcends time and distance. Finally, in the end, the true significance of July 15 is revealed. Witty, thoughtful, somber, quirky, hilarious – this is a story that will bring you to tears and also make you laugh out loud. That movie has a lot to live up to. Herb & Dorothy, an Arthouse Film by Megumi Sasaki, tells the amazing story of the Vogels–a couple who built one of the most extensive collections of minimalist and conceptual art despite their modest incomes. As former artists themselves, Herb and Dorothy began collecting other artists’ work in the early 1960’s with two rules in hand: 1. the piece had to be affordable and 2. it had to fit in their small, one-bedroom apartment. They decided to live on Dorothy’s salary from working at the Brooklyn Public Library and use all of Herb’s Postal Clerk earnings to buy art. But Herb and Dorothy didn’t just buy art, they also cultivated intimate relationships with some of today’s most famous artists who were virtually unknown at the time they were sought out by the Vogels. In 1992, the over 4,000 piece collection was moved from the Vogel’s tiny apartment to the National Gallery of Art after much wooing from museums and institutions around the world. 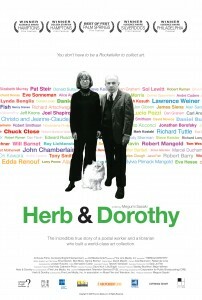 In the film, Herb explains how important it was for him and Dorothy to donate their priceless collection to the very people who paid their salaries (taxpayers) and thus made their means of collecting possible. The Vogels have since created the Vogel 50×50 program where 50 of their works were donated to a museum in each of the 50 states, and Iowa’s recipient was the fantastic Cedar Rapids Museum of Art (their first exhibit of the donation, Less is More: The Vogel Gift of Minimal and Conceptual Art, just ended in May).